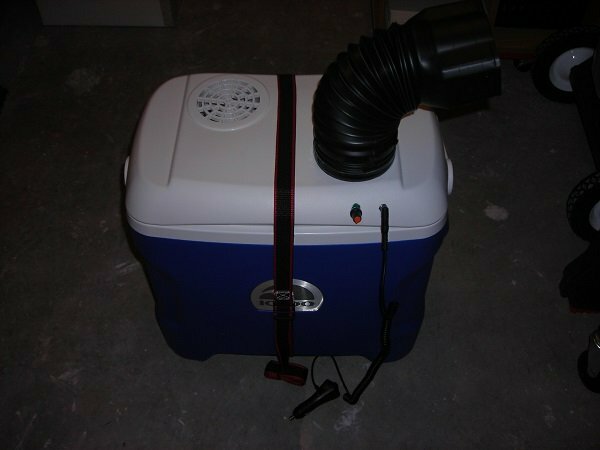 I decided to combine some of the ideas I found online how to make a cheap non-evaporative air-conditioner. The basic idea is to blow air through ice or cold water to cool it down. 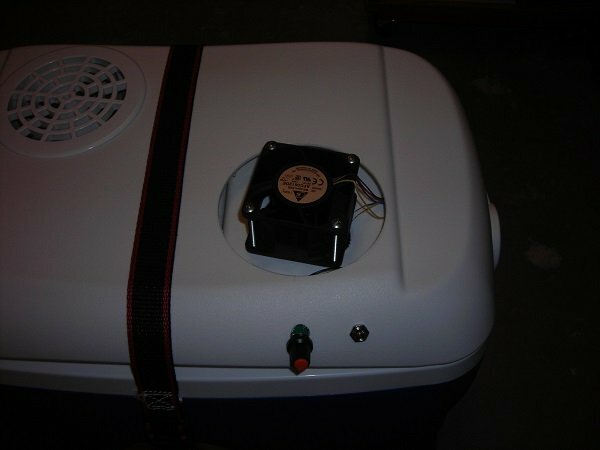 The simplest solution is to fill a cooler with ice and have a fan blow air into the cooler and out from another opening comes cooler air. But that simple solution does not provide a lot of air/ice surface for heat exchange. Particularly once the ice starts melting the pool of water reduces the exchange surface and thus the amount the air is cooled. A few clever folks have used heater cores and a bilge pump to pump cold water through the heater core and air over the heater core to cool it down. This system does work better, because the heater core has a high surface area which does not change over time. However, it is a fair bit more complex and expensive to make such a cooler, because we need some kind of immersible pump which needs power and then plumbing from the pump to the heater core and the fan to blow the air. I came up with a simple solution which retains the advantages of the heater core type system but does not need a heater core or a bilge pump. The idea is very simple. Instead of dumping a bag of ice into the cooler I take about 20 small (0.5 liter) water bottles. Fill them with water and freeze them. The advantage here is that even if the ice starts melting it will not mix with ice and water in other bottles. This system will have constant heat exchange surface regardless of how much ice has melted - similar to the heater core method. 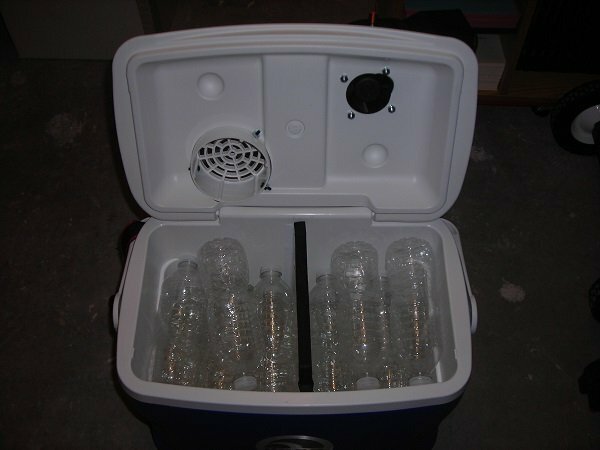 The second improvement is that I place a separation wall in the middle of the cooler which forms an airtight seal on the top with the lid but is open on the bottom. This means that air first has to travel all the way down on one side and then up the other side rather than take a shortcut across on the top. This assures proper cooling of the air. I am using an Igloo cooler that I bought at Target for $20 or so. I am using a strap to make sure the lid does not open. At the left back of the lid you see the air intake which was made by drilling a 4 inch hole and inserting a PVC vent cover. The outlet is on the right side and is a black gutter extender. It is a plastic pipe that can be bent and it will stay in that shape. It was the cheapest pipe I found with that property. It costs $3-$4 at Home Depot. This is a close up with the outlet pipe removed. You can see the fan which is a powerful 12V fan that has been screwed into the lid. From the inside I cut out a smaller hole just enough to match the fan diameter. And from the outside I drilled another 4 inch hole for the outlet pipe. The lid of the cooler is double walled which is very helpful in this case. The electrical portion consists of a power jack and a fan speed controller. The power jack is connected to a car 12V outlet (I have it attached to a GoalZero Yeti 400 which is in the back of my car). The fan speed controller allows me to turn the fan on and increase its speed to the maximum. Here you can see the inside. The most important part is the divider in the middle which was made from honeycomb cardboard and a foam insulation on the top. The water bottles are stacked inside the cooler in alternating orientations. I selected the cooler such that these Poland Spring bottles would fit well. I like these bottles because they are fairly thin walled and their shape does increase the total surface area - all advantageous features to increase the heat exchange between air and ice/water. 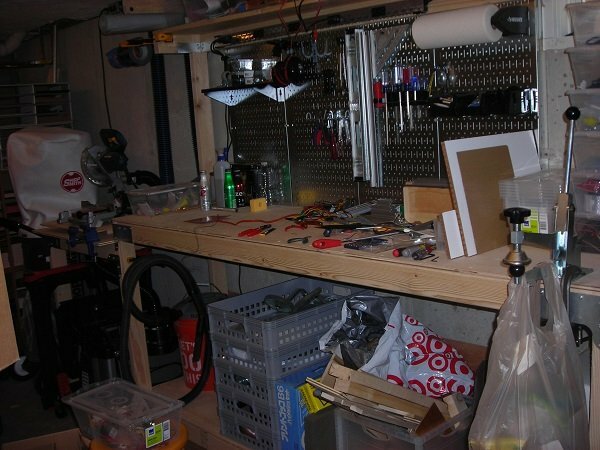 This is a photo of the workbench I built from 2x4s and some Simpson Strong Ties.